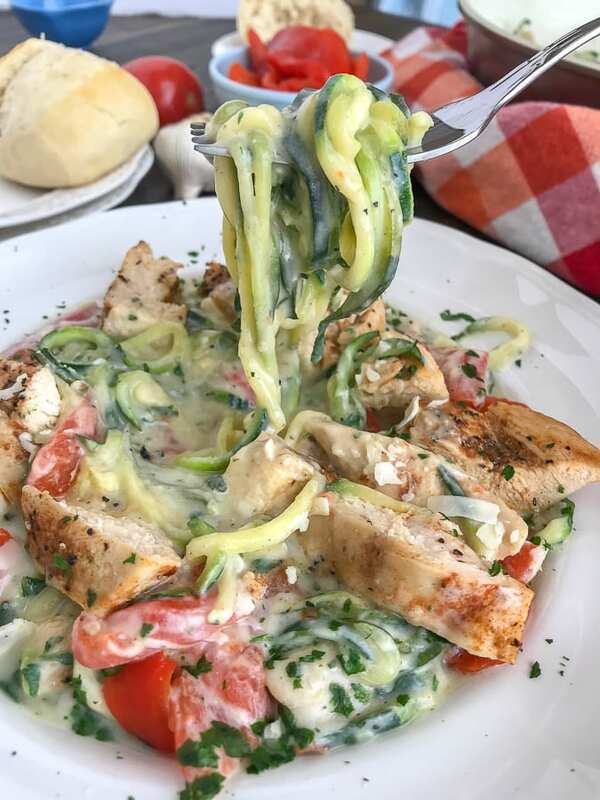 This Grilled Chicken Cauliflower Alfredo with Zucchini Noodles recipe has so much going for it as far as flavor, creaminess, and texture. 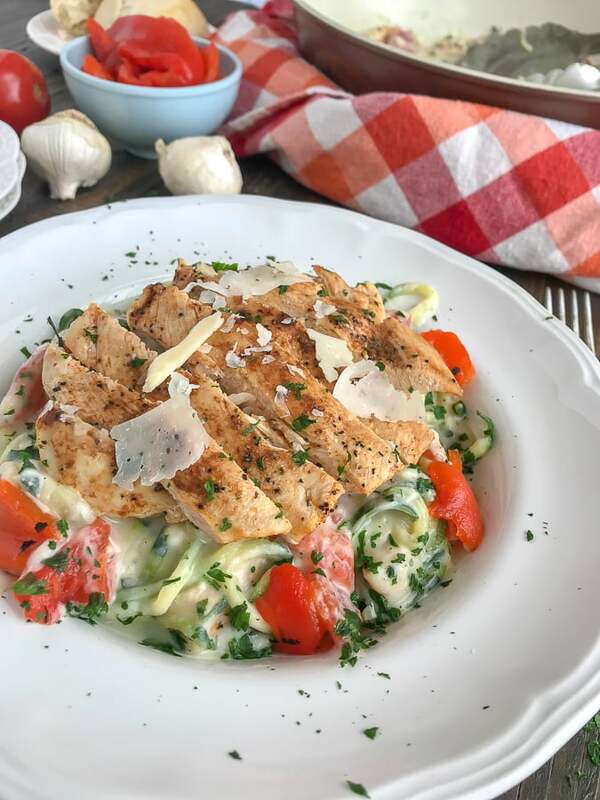 If you’re looking to enjoy a chicken Alfredo dish, but also want to cut back on calories – then this is the recipe for you coming in at under 275 calories per serving! Not only does it deliver when it comes to flavor, but it serves as the perfect guilt-free indulgence. I have been working with cauliflower as a sauce replacement for several years and I truly think I have perfected the sauce.This recipe reached a point that I would not change a thing. Makes it a keeper then, right?? You are going to be pleasantly surprised at how delicious this recipe is. 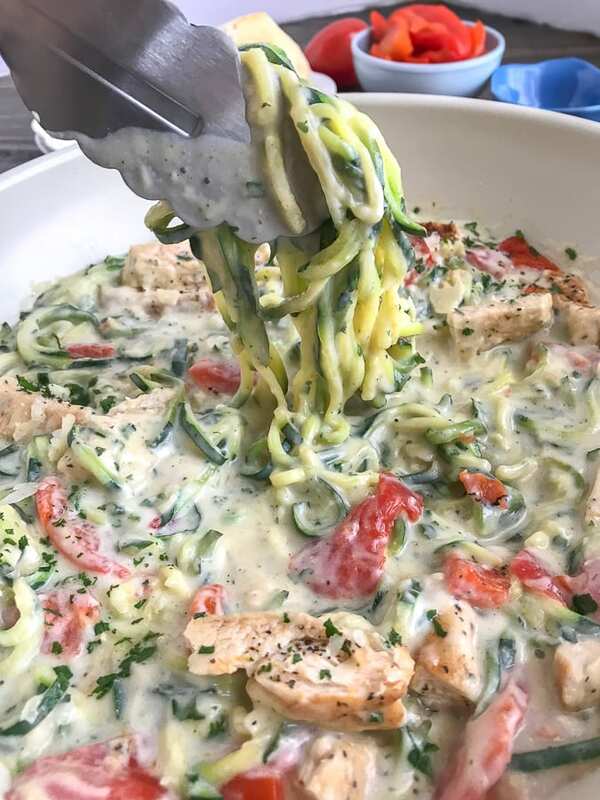 Between the perfectly replaced Alfredo sauce to the zucchini noodles – you won’t miss the traditional dish. Much! Ha! Let’s be honest – the real thing is divine, for a reason! This one takes the cake for a healthy substitute, though! Did I mention the sauce can be dipped? Or even stand alone? Can be combined with other dishes? If you’re interested in the sauce alone, then check out my Creamy Cauliflower Alfredo Sauce recipe. 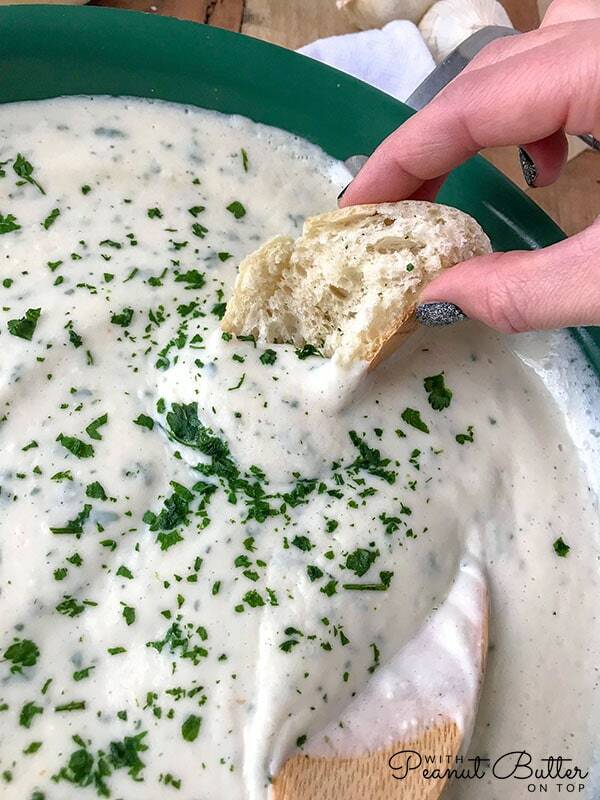 You are going to be soaking up every last bit of this sauce with your favorite bread. That just means a clean easy-to-wash plate, right? If it even leaves the pan! Not to mention happy eaters. You know I firmly believe that when someone is silent while eating – you’ve done your job. Anyone else agree with me? How can you not only love how versatile cauliflower is, but also – that you can spiralize vegetables (such as zucchini) to replace noodles, creating a healthier, low-carb option to pasta? If you’re not a fan of zucchini noodles, then you’re more than welcome to sub out the noodles for traditional pasta or rice. You can even substitute the chicken for another meat, such as shrimp, or omit it for a meat-free version. The dish can stand alone without any meat support. HA! I boiled my cauliflower florets in low-sodium chicken broth. You can swap for vegetable broth, or even water – but I feel that broth truly helps add some flavor to the sauce. The pan used in my cooking was a Cast Iron Square Grill Pan to grill my chicken, but feel free to pan fry or use your outdoor grill. I do recommend grilling it, as it gives the chicken a great crispy texture that enhances the dish. If you’re not a fan of heat, you can either omit or use the Crushed Red Pepper Flakes sparingly – a little goes a long way. The roasted red peppers are optional, but just as I mentioned about grilling the chicken – they do help add some great flavor. I used a store-bought jarred version for convenience purposes, but I do highly recommend roasting them yourself as fresh is always best. Follow my How To Roast Red Peppers directions – they won’t steer you wrong! Very easy to do. Be sure to drain as much of the water from the jar as you can. The zucchini will naturally release water when it has cooked. Using frozen roasted red peppers may add additional water as well. Allow them to thaw and pat dry prior to cooking. – If you’re new to spiralizing or not seeing the results you’re looking for (ex. 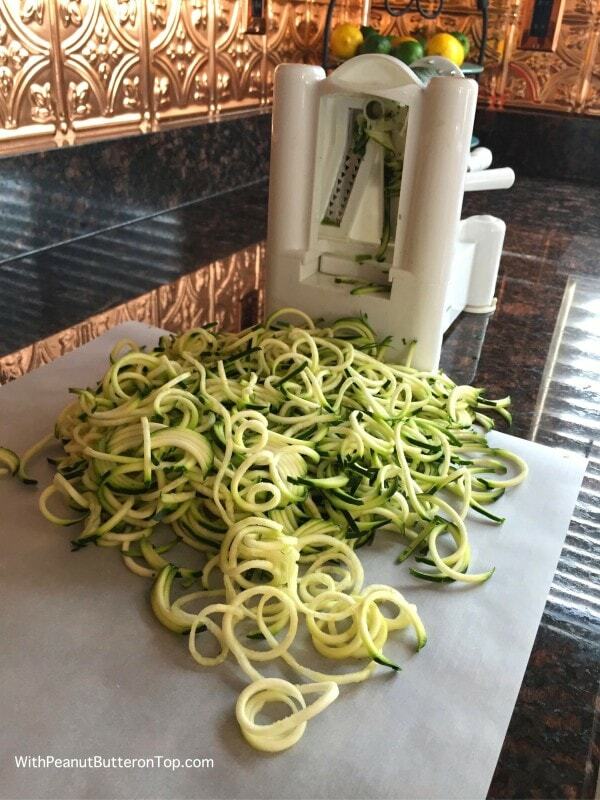 too runny/mushy zucchini noodles), I recommend looking into the Paderno Vegetable Slicer/Spiralizer. It is what I own and have been using for several years. When I spiralize vegetables, I use the blade with the thicker/wider option. This helps to keep from having mushy or watery zoodles when you cook them. The thicker they are, they will stay a bit more tender when cooked. I have not used any hand-held spiralizers, so I cannot attest to the use of those. 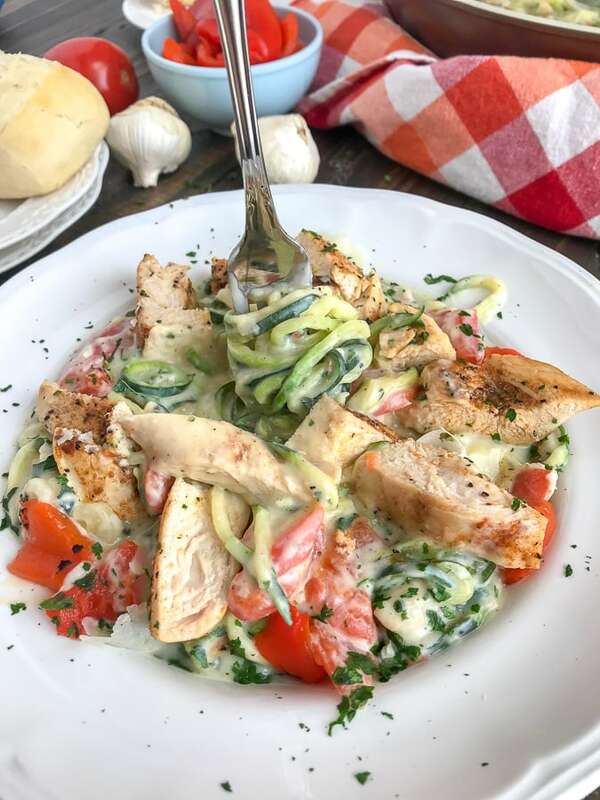 Excited about this Grilled Chicken Cauliflower Alfredo Zucchini Noodles recipe and anxious for more delicious, healthy recipes? 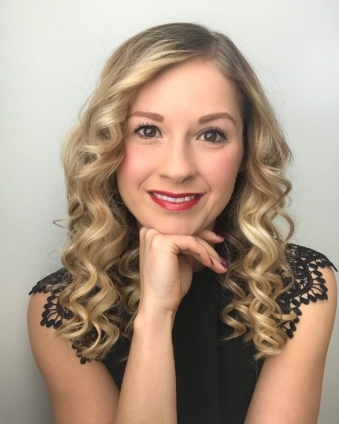 Sign up for my newsletter below! 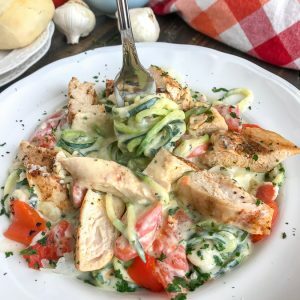 This Grilled Chicken Cauliflower Alfredo with Zucchini Noodles recipe has so much going for it as far as flavor, creaminess, and texture. 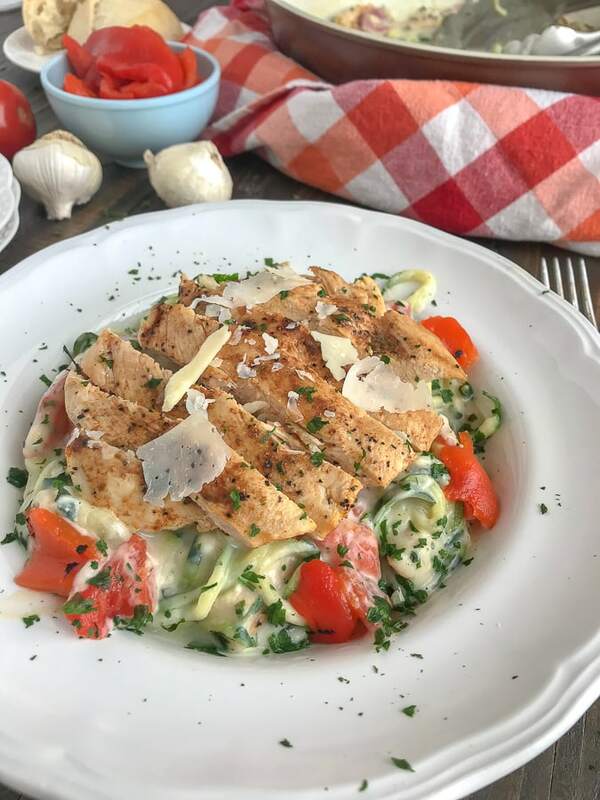 If you're looking to enjoy chicken Alfredo dish, but also want to cut back on calories - then this is the recipe for you. Not only does it deliver when it comes to flavor, but it serves as the perfect guilt-free indulgence. *Be sure to drain as much of the water from the jar of roasted red peppers as you can. The zucchini will naturally provide water when it's cooked.Using frozen roasted red peppers may add additional water as well. Allow them to thaw and pat dry. I used a store-bought jarred version for convenience purposes, but I do highly recommend roasting them yourself as fresh is always best. Follow my How To Roast Red Peppers directions - they won't steer you wrong! Very easy to do. M 13yo son and I just got done making and eating this dish. We both really loved it! The only issue was the sauce wasn’t creamy. 🙁 It came out grainy. I think we just needed to blend it more. The flavor though was on point! We also just used regular fettuccini noodles since I don’t have a spiralizer. Thank you for the recipe! I can’t wait to enjoy more dishes! Just made this recipe – sooo good. I added SAUTÉED Mushrooms and spinach to really kick up the veggie content. Only thing i would change is probably using a half cup of roasted red peppers. I felt a Whole cUp tooK awaY from the creamy and NUTTINESS of the sauce. Hey Chelsea! I’m so glad you enjoyed the recipe! As far as the serving size, I don’t measure the servings/food in that way. I add all of the nutrition for each ingredient together and then divide by the number of servings the recipe will make. DelicIous! Though i am wondering if you can save thE zucchini noodles for later… either before cooking or alteasy cooked. AlSo if you can even freeze them, Have you tried? Hey Daniela, I think zoodles, uncooked, can be kept in the fridge for 2-3 days, but I would not say the same for cooked. Cooked zoodles are best when served right away.I have never had the desire to freeze zoodles as I can’t imagine the texture would be there? Flavor was delicioUs, but i couldnt get it creamy no mattEr how much i pureed and “prOcessed” and No matter how much broth i added. It stayed the consistency of loose mashed potatoes. Any iDeas? Hey Nikki! I am glad you enjoyed the flavor. The only thing I can think is perhaps the cauliflower wasn’t cooked all the way through – fork tender? Made this for dinner tonight and it was delicious! Hubby approved 🙂 And the cauliflower alfredo sauce is to die for! thank you ! Yay! So glad you and your husband liked it so much! Thank you!! I left a review of the cauliflower alfredo sauce but wanted to leave a review of this dish also. We loved it. I couldnt believe how rich and creamy the cauliflower alfredo sauce was. I used fage 2% greek yogurt which is creamy all by itself. This Recipe makes healthy eating so easy. ThiS dish is going in our rotation. Thank you!